Septic tanks aren’t a fit and forget aspect of sanitation and are a major cause of blocked drains across the UK. The failure to routinely empty and inspect septic tanks contributes to failures as well as the prevalence of backed up waste which poses a large health and safety hazard. Drain cleaning and the maintenance of your septic doesn’t have to be difficult or time consuming so in this article, we’ll provide you with an overview of the benefits of keeping your drainage and sanitation system in good health. Septic tanks can often fail after extended periods of bad weather where heavy rainfall is prevalent. The presence of excessive water will usually cause septic tanks to overflow as well as cause effluent waste to appear at ground level where it can seep into your home and across your property. 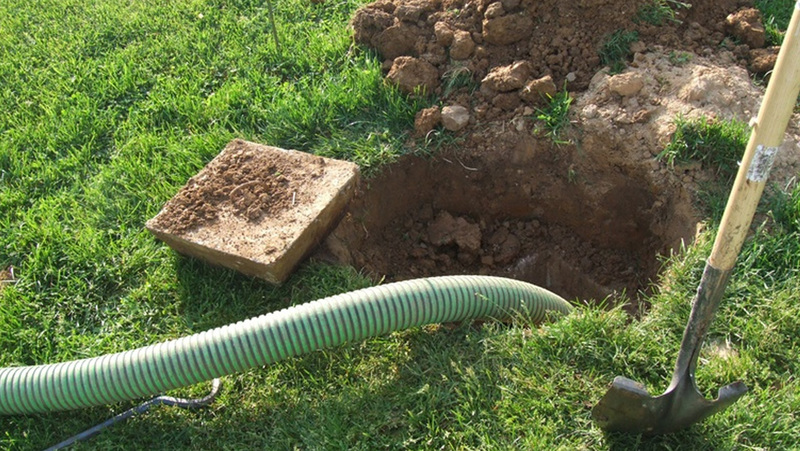 Because of this, the soakaway associated with your septic tank should always be installed properly rather than just consist of a hole in the ground filled with stone. This type of basic soakaway is only suitable for surface water. Septic tank soakaways need to be installed within the correct aerobic layer of soil. This soil is oxygen rich and can only be found within the first metre of soil below ground level. The job of a soakaway is to not only remove excess water but also to help in the digestion of waste through aerobic soil bacteria that relies on the presence of oxygen. If the soakaway is deeper than one metre below ground, it will be sitting within the anaerobic layer of soil which is a problem as anaerobic bacteria create a by-product in the form of sludge when digesting waste. This sludge can directly contribute to blocked drainage pipework. Finally, your septic tank needs to be installed correctly and not back to front. A back to front installation willsee your outlet pipe sitting at a higher level than your inlet pipe, almost guaranteeing failure through an inability to drain properly. Of course, septic tanks only have a limited capacity. Domestic septic tanks need to be emptied at least every 12 months, and sometimes more often depending on the size of tank and the number of people living within your home. Failure to do so will result in blockages and backed up pipework that could overflow and require an extensive clean up process. If you’re having trouble with your sanitation and drainage system or you just want to keep on top of maintenance, you should get in contact with a drainage specialist. Any drainage company will be able to unblock your drains and prevent the problem from reoccurring. If you’re in the South-East, a drain cleaning company in Ashford will be able to pump and empty your septic tank. Simply locate your nearest one and request a quotation.